Do you enjoy driving a luxury vehicle but prefer something a little different than what most people drive? If so, you should check out the new INFINITI QX50 Luxe at a reputable dealership just outside of Westwego, LA. Once you’re there, you can look at all the features up close and take the SUV for a test drive. For one thing, the 2019 INFINITI QX50 Luxe has a timeless beauty. If you appreciate a well-designed automobile, you’ll love this one. The body profile is a unique combination of smooth curves and sporty edges. As for power, this SUV has a four-cylinder 2-liter turbocharged engine with CVT and all-wheel drive. Compared to other SUVs in its class, the new INFINITI QX50 Luxe has more standard features to offer. For example, this vehicle boasts intermittent rear wipers, a roof rack, variable intermittent windshield wipers, and an extended sunroof with one-touch power. Then, with a rear spoiler and 19-inch alloy wheels, you can anticipate people staring as you drive past. The amazing safety features on the 2019 INFINITI QX50 Luxe make it an easy choice. LED headlights, blind spot warning, daytime running lights, fog lights, and dusk-sensing headlamps all come standard. It also boasts tire pressure warning, both traction and stability control, a pre-collision safety system, emergency braking assist, and a front passenger-sensing airbag system. With all of this and more, you and your passengers have optimum protection on the road. The automaker went all-out when building the new INFINITI QX50 Luxe. On the interior, you’ll appreciate standard features like an eight-way power adjustable driver’s and front passenger seat, driver-side lumbar support, rear ventilation, reclining and split-folding rear seats, and heated mirrors. However, this SUV comes with a lot more, such as keyless start, rearview camera, cruise control, leather-wrapped steering wheel, and a premium audio system with six speakers. Instead of buying just any luxury SUV, why not go with something that has a unique personality? The 2019 INFINITI QX50 Luxe is in a league of its own. With an abundance of standard features and a long list of available options, you can customize your ride any way you want. When you’re ready to purchase a new SUV, it’s important that you do business with a trusted and reliable source. 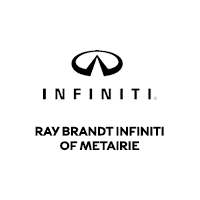 Ray Brandt INFINITI has a long history of assisting people that are interested in both buying and leasing. Give us a call or visit us in person at our Metairie location, not far from Westwego, LA, for an excellent experience.